Miami (AFP) - On billboards across the Florida Everglades, a burly Native American man pries open an alligator's mouth, pressing his face dangerously close to the reptile's 80 glinting teeth. "Adventures Await," the ads promise, as motorists whiz by. 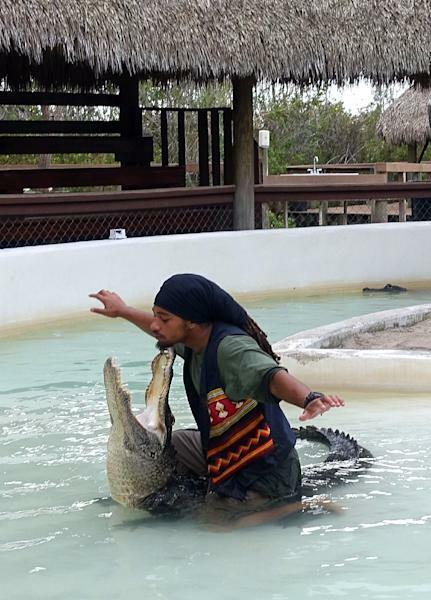 The man's name is Rocky Jim, Jr., a 44-year-old Miccosukee Indian who has been wrestling alligators for 31 years, entertaining countless tourists from a sand pit and pond beneath a chickee hut along the Tamiami Trail, a two-lane road linking Miami to the port city of Tampa. 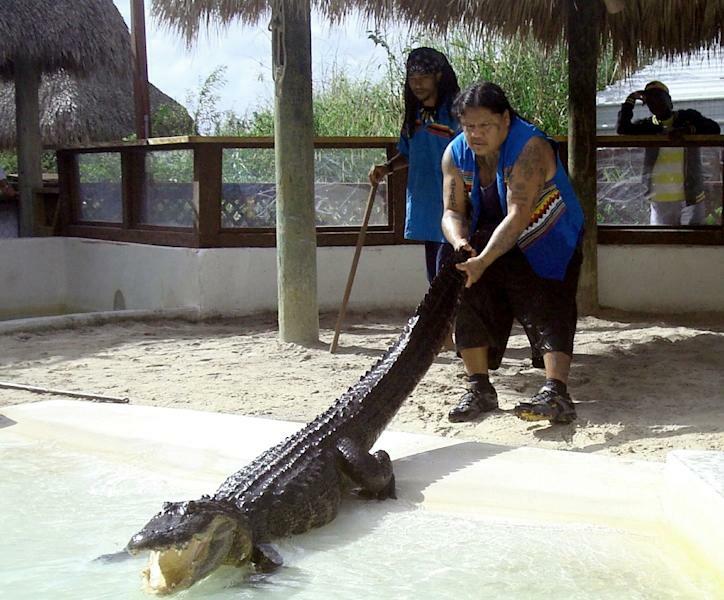 But on the final Sunday of 2015, the last remaining Miccosukee Indian in the century-old tradition of wrestling alligators decided it was time to step down, leaving no successors in sight among the tribe of around 600 people. The end came just minutes into the 1 o'clock show, when Jim coaxed the alligator's mouth open by gently tapping its snout, then placed his hand inside. The move is perilous only if something touches the alligator's palate -- a drop of sweat, a grain of sand -- causing the jaw to reflexively snap shut. While pulling out his hand, he rotated it slightly and accidentally grazed a tooth. The feeling was like "a door slamming on your hand. With sharp teeth," Jim said in an interview later. But in the moment, as he looked down at his palm and forearm encased in the alligator's jaw, he had only one thought: "Don't shake." "If it shakes, my hand is going to go with it," he told AFP, describing the thrashing motion alligators use to slice up fresh meat, much the same way as sharks. "Its natural instinct is to do that," said Jim, who had been bitten several times before. Alligator wrestling is considered a Native American tradition, first popularized in the early 1900s by a white man, Henry Coppinger, Jr, the US-born son of Irish immigrants, according to historian Patsy West. Coppinger himself wrestled alligators, and recruited natives -- who lived alongside the reptiles and hunted them -- to perform, too. Paying crowds flocked to see men climb on alligators' backs, open their jaws and flip them over -- with the effect of making them go limp for a few minutes. But today, the tradition is waning. Animal rights group have criticized the shows, casino revenue rather than alligator tourism often provides cash flow for native tribes, and Indian youths are increasingly turning to careers in modern society. "The skills are not as common as they once were," said author and anthropologist Brent Weisman. Some native alligator wrestlers still remain among the larger Seminole tribe of some 2,000 people, which shares a historical connection to the Miccosukees. Those that remain "have decided to do it very deliberately, not for a tourist attraction as it once was, but as a way of keeping traditional Seminole culture alive," Weisman said. Jim was 13 when he learned to handle alligators from his father, Rocky Jim, Sr. 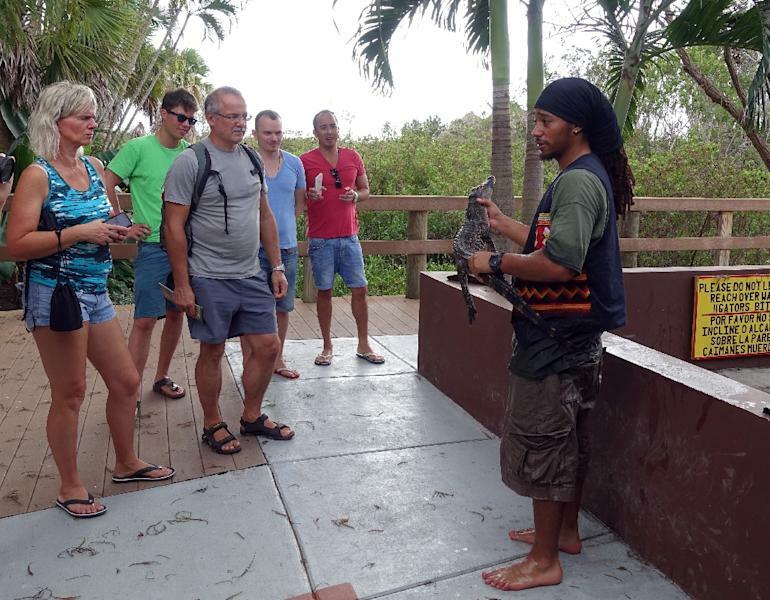 They would go out in the canals of the Everglades in search of turtles, and the elder would demonstrate how to move the creatures away without hurting them, or getting hurt. "Just see how they are moving and how they are going to react," Jim recalled his father saying. "Just read their body language." Jim was in his 30s when the tribe asked him to perform at the Indian Village, a tourist stop that sells crafts, offers airboat rides and hearty foods like pumpkin fry bread and catfish. He agreed. Far from a punch-out, smack-down event as the name "alligator wrestling" might imply, Jim became famous for pulling wild, hissing alligators heavier than his own 278-pound (125-kilogram) frame out of the water by their tails, then tip-toeing around them, stroking them, tapping them, even getting close enough to touch his nose to the snouts of the most aggressive among them. "We just respect them," he said. When he first saw Jim perform, Pharaoh Gayles, a 25-year-old wrestler of Puerto Rican, African-American and Seminole descent, "thought he was a little bit crazy." But he watched, and learned. "He just really knows what he is doing and he has an understanding of the animal." Recently, arthritis in his knee began to slow Jim down, and he cut back to part time. But this winter, an annual festival beckoned. He performed five shows on the first day, as Gayles knelt in the pit with him and narrated for the audiences. Driving home that evening to his home in a Miami suburb, Jim saw a shadow of a man by the side of the road. A couple of yards later, an owl flew in front of him. "For us, an owl means somebody will pass, and a shadow is the same thing, so when they are together it is a bad thing," Jim said. The next day, the alligator bit him. Fortunately, the animal did not thrash. Gayles helped open its jaws, which left Jim with seven puncture wounds, and his mind made up to retire. "I was just really waiting for the right time. I guess this was the right time," he said. For Gus Batista, who wrestles alligators on a Seminole reservation, Jim "has been a big partaker in this beautiful art" and "has earned the right to bow out honorably." And while Jim's absence leaves a void, he has already begun teaching his 13-year-old son to catch baby alligators -- not necessarily to make it his trade, but to keep a tribal tradition alive.